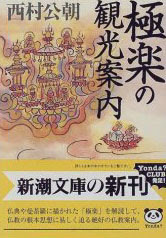 Welcome to Gokuraku - the life of Buddha and the Buddhist Paradise - and Jigoku, the Hell !
. Yakushipedia - ABC-Index 薬師如来 . Kani Yakushi 蟹薬師 "Crab Yakushi"
Situated on the Western Side of 御嶽宿 Mitake-Juku of the old 中山道 Nakasendo road. The temple was first built in 713. In 815, 伝教大師（最澄） Dengyo Daishi Saicho dedicated the statue of Yakushi. The temple was lost to fire many times in its history, but usually rebuilt in greater splendor. 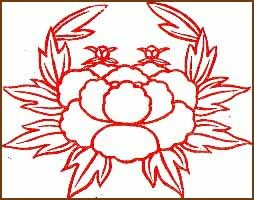 A special hall for the Yakushi Statue, 薬師如来の厨子堂, was built in 1610.
. kamon 家紋 family crest - Introduction . 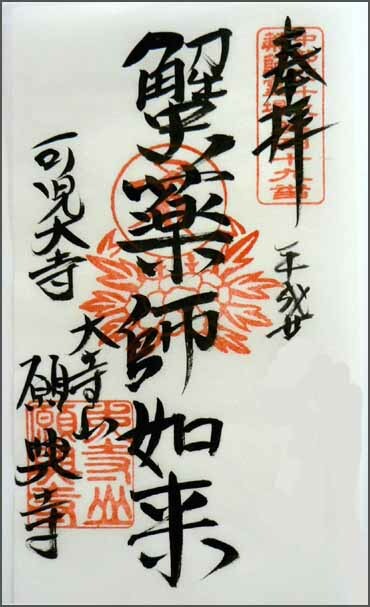 At the age of 36, Saicho visited China with Kukai (referred to as Kobo-taishi) as a member of Kentoshi (a mission represening Japan to China). 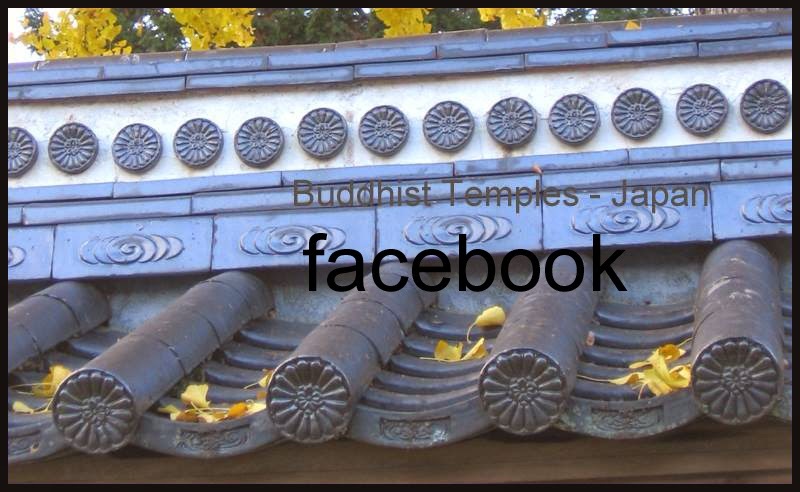 On his return from China, he founded Enryakuji Temple (the headquarters of Tendai-shu, a faction of Buddhism) at Hieizan in north-eastern part of Kyoto. In order to carry out the Tendai-shu’s tenet “relieve all the people”, Saicho travelled all around Japan and finally reached Mitake via Tosando (an old passway connecting northern Japan and Kyoto). 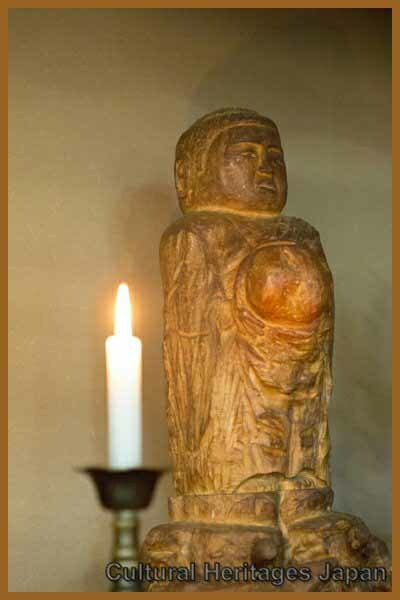 At that time the area surrounding Mitake was suffering from epidemic, so he built a fuseya, leaving a hand-made sculpture of Yakushi-Nyorai and said his prayer for the residents’ recovery. There was a very clever girl who was a daughter of Emperor Ichijyo. She boasted about her own ability but the Emperor was uncomfortable with her attitude and drove her out of Kyoto. She started travelling along the Tosando , but during her trip she became exhausted and much thinner than before. It was already winter when she arrived in Nakamura village (currently called Naka district in Mitake-cho) in her ragged clothes. She built an hermitage with the help of neighbors in the village and began to live there. She shaved her hair and became a nun named Gyouchini, praying for Yakushi-Nyorai every day. At that time, a line of light began to appear every night from a pond at the foot from the mountain in the south of the village. Fierce wind blew, waves in the pond and a roar of mountain went accompanied the light. Gyouchi went close to the bank of the pond in the evening and found the pond had flooded and the entire village was under water with people almost drowned. Gyouchi counted her beads and kept praying, gazing the pond. Then an enormous 30-meter-long, big snake suddenly appeared and tried to swallow her. Despite the snake’s appearance, Gyouchi just kept praying for Yakushi Nyorai without any fear. After a while the wind and wave stopped, and a small 6-centimeters-long image of Buddha surrounded by small crabs appeared in front of her. Inspired by this development, Gyouchi said her prayer for the image and enshrined it in her hermitage. On hearing the whole story, the Emperor Ichijyo issued a permission to build a sanctum there. This led to the establishment of a magnificent Shichido-Garan style temple in 998 named “Oterasan-Gankoji”. Gankoji was burnt down in 1108 (the first year of Tenjin Era) during a rebellion led by Yoshitsugu Minamoto. At that time the image of Yakushi-Nyorai was moved to and enshrined at a shrine in Tsushima, Aichi Prefecture. After a while, the Yakushi-Do (a hall to enshrine Yakushi-Nyorai) was rebuilt in the premises of Gankoji. 100 years later, Koketsu Gengo Yasumori (in his capacity as Jito, an administrator of the Mitake area from the central government) re-constructed the rest of Gankoji. In 1572, in the midst of the battle between Takeda and Oda, a servant of Shingen Takeda set fire to Gankoji and burnt it down. As valuable images of Buddha and scriptures were kept ivied Gankoji, a number of monks of Gukeiji temple rushed into Gankoji and carried them out of the temple. Thanks to their work, all the images and 600 sets of scriptures remained intact. The images were kept in a temporary hall in the premises of Gukeiji for a while. Shingen Takeda, an enthusiastic believer of Tendai-shu, expressed his strong anger with his staff for setting fire to the Gankoji. 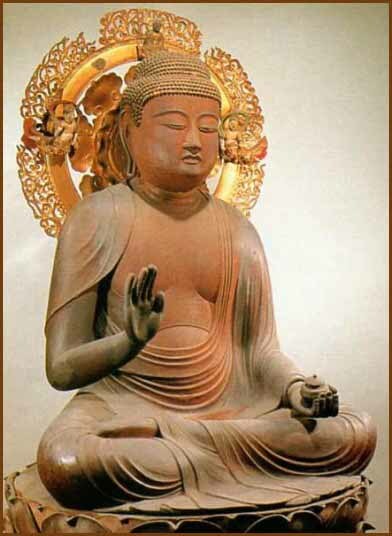 It is believed that he gave residents in Mitake area his promise to rebuild the temple. However, Shingen died before undertaking the restoration. 10 years later, led by Yojiro Tamaki, residents in the area began to rebuild Gankoji by themselves. Not only did they collect a fund from neighboring temples and shrines, but also brought wooden boards and pillars voluntarily. The restoration was completed in 1582 (the 9th year of Tensho Era). One feature of the present hall is its wide corridors. This shows the residents’ thoughtful consideration in order for travelers to avoid rain during the night. The other is that the humble style of the back of the hall compared to the front. It shows that the residents tried hard to rebuild the hall within their financial constraints. In the concert on the 23rd November 2006 held during the event “Nakasendo Walk”, Mr. Bincho Tanaka, a teacher of Gagaku both in Japan and all over the world played a whistle. In the concert which took place at Gankoji, some attendees would have felt eternal history as in the air the Emperor Ichijyo was known as an expert of whistle.
. Dengyo Daishi Saicho 伝教大師最澄 . 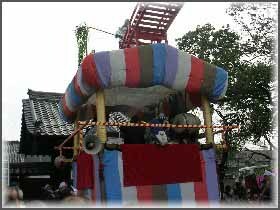 The Gankoji Festival is originated in 999 (the 5th year of Chotoku Era), when the Shichido-Garan style temple was completed. Since then, ceremonies such as Daiji-Hyoshi, Shishi-mai and Hae-oi have been held part of the festival. Among them, Hae-oi was an important ceremony to drive off something unclean, given that could an epidemic, which was a matter of life and death at that time. It is believed that the mask used in the Hae-oi ceremony was created by Gyouchi. There were two types of heads of Shishi (an item used in Shishi-mai lion-head ceremony), one was male and the other was female. When the male one was used, clothes and a mask for a male were used in the Hae-oi ceremony and vice versa. This statue was dedicated to the temple by a medical doctor to pray for confining cancer. Both words of KANI in Japanese and cancer in astronomy in English share a common meaning, that is, crab. In view of such a relationship, the doctor wanted to have this statue created for dedication.
. Hooraiji 鳳来寺 Horai-Ji Yakushi, Mikawa, Aichi .
. Yakushi Nyorai - Legends from the provinces .
. Yakushi Nyorai Pilgrimages 薬師霊場巡り - Introduction .
. O-Mamori お守り　Amulets and Talismans .
. Japan - Shrines and Temples - ABC List .